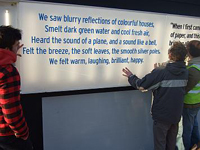 UrbanWords worked with Spread the Word and Art on Greenwich Peninsula on an Awards for All funded project, Almost An Island – a writing project based on the Greenwich Peninsula in East London. Sarah Butler and Aoife Mannix were writers in residence on the peninsula, September – November 2008. 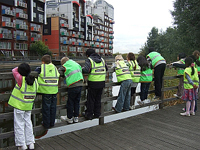 They met with local groups, residents and visitors, and ran free drop-in workshops and activities. Writing by Sarah, Aoife and workshop participants is showcased on the Almost an Island? blog. Sarah and Aoife have created a sound piece, combining their own writing with the voices of those living on, working on, and visiting the Greenwich Peninsula. They presented the piece at the Artists Making Places conference organised by Art on the Greenwich Peninsula on 10th November. Listen to the first part of Almost an Island? here.